Reference number for this case: 11-oct-54-Riom. Thank you for including this reference number in any correspondence with me regarding this case. During the night from the 10th to the 11th of October at 00:45, policemen Robert Thévenin and Albert Daury, of the urban squad of Riom, clearly saw a machine in the shape of a cigar in the sky which followed the direction south-north. Balls of fire were ejected from the front of the cigar and lit it. Three of these balls were counted by the civils servant and in their gleam, the apparatus shone like duraluminum. Almost at once after their ejection these balls died out. The total vision of the phenomenon lasted several seconds. Aimé Michel indicates that the two police officers Thévenin and Daury, of Riom, in Auvergne, which carried out their round in the second half of the night from the 10th to the 11th of October, had seen "a craft in the shape of a cigar which moved South to North. Three brilliant balls were detached and flew in quick circles. The cigar, continuing its flight, also disappeared towards the North" in the sky. The author indicates that among the cases with an expulsion then a re-entry of saucers from a big cigar, there is the case of Riom in the Puy-de-Dome, October 11, 1954, reported by Aimé Michel on page 271. The magazine indicates that on October 11, 1954 in Riom, M. Thévenin et M. Daury, policement, on night patrol, saw a cigar-shaped craft on a South to North trajectory, and that 3 luminous balls detached from the craft. Aimé Michel is indicated as source. The two authors indicate that in Riom in the Puy-de-Domes on October 11, 1954 at 00:45 a.m., two policemen observed a machine in the shape of a cigar from where balls of fire escaped. 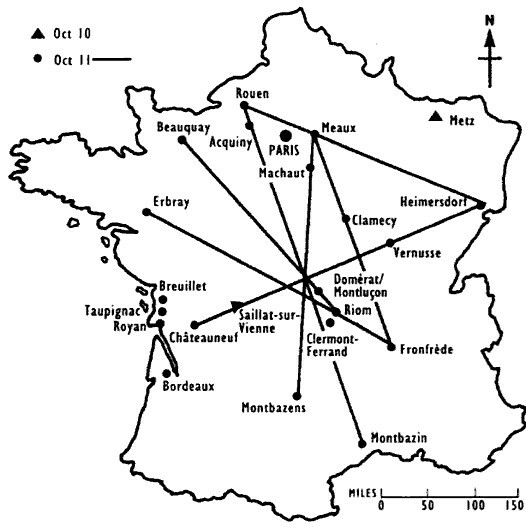 The authors indicate that the source is La Montagne for October 12, 1954. Godelieve van Overmeire indicates that in 1954, on October 11, in France, in Riom, the Puy de Dôme, at 0:45, two policemen observe a craft in the shape of a cigar from which balls of fire escape. The source is notedM. Figuet / J.L. Ruchon in "Ovni, Premier dossier complet..." éd. Alain Lefeuvre 1979, p. 152. Luc Chastan indicates that in the Puy de Dômes, in Riom, on October 11, 1954, at 00:45 hours, two policemen observe a craft in the shape of a cigar from which three bright balls escaped, which circle quickly. The whole disapears toward the north. The source is indicated as M.O.C. by Michel Aimé ** Arthaud 1958. The website indicates that on 10 October 1954, in Riom, France, there was a "cigar-shaped UFO moving S-N; three glowing objects detached and moved away. Cigar-shaped objects were observed. Four cigar-shaped objects, about 5 feet across, were observed by one witness in a city (Thevenin)." The sources are indicated as Michel, Aime, Flying Saucers and the Straight-Line Mystery, S. G. Phillips, New York, 1958; Vallee, Jacques, Computerized Catalog (N = 3073); Vallee, Jacques, Challenge to Science: The UFO Enigma, Henry Regnery, Chicago, 1966; Vallee, Jacques, Preliminary Catalog (N = 500), (in JVallee01); Hall, Richard H., The UFO Evidence, NICAP, Washington, 1964; Hatch, Larry, *U* computer database, Author, Redwood City, 2002. Not looked for yet. A jet dropping additional tanks? They would not have been visible in the night. [---] Article in the regional newspaper La Montagne, Clermont-Ferrand, France, 12 octobre 1954. 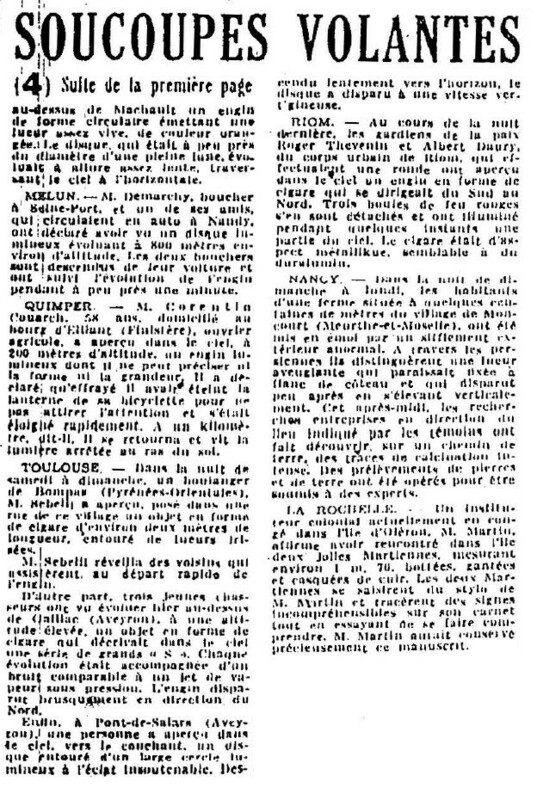 [qh1] Article in the regional newspaper Le Quotidien de la Haute-Loire, France, October 13, 1954. [mc1] "Les Apparitions de Martiens", book by Michel Carrouges (aka. Louis Couturier), Fayard publisher, France, page 235, 1963. [ld1] "Les archives de 1954 pour le Puy-de-Dôme", in the ufology magazine Lumières Dans la Nuit, #125, page 26, May 1973. [am1] "Mystérieux Objets Célestes", book by Aimé Michel, Seghers publishers, page 217, 1976. [fr1] ""OVNI, Premier Dossier Complet des Rencontres Rapprochées en France", book by Michel Figuet and Jean Louis Ruchon, Alain Lefeuvre publisher, France, page 152, 1979. 1.0 Patrick Gross December 19, 2008 Conversion from HTML to XHTML Strict. First formal version. Additions [mc1], [go1], [lc1]. 1.3 Patrick Gross September 21, 2014 Addition [ha1]. 1.5 Patrick Gross December 30, 2016 Addition [fs1].